(CNN) -- Two children and one adult were killed Friday after a man with a painted face launched a knife attack at a children's daycare center in Belgium. 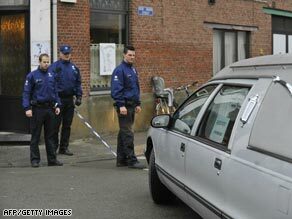 Police look at a hearse parked in front of the childcare centre in Dendermonde where the attack took place. Officials said two adults and 10 children, some of whom were in a critical condition, were being treated in hospital following the attack in Dendermonde, 25 kilometers (16 miles) northwest of Brussels. "The guy just went crazy," local official Theo Janssens said, according to Agence France-Presse news agency. He was arrested an hour and a half afterwards, according to the Interior Ministry. Reports said he was trying to make his escape on a bicycle. The attacker entered the day care center in Dendermonde, about 16 miles northwest of Brussels, around 10 a.m. (4 a.m. ET) and began stabbing children and staff, the ministry said. "Witnesses say he looked calm. There was no security and he just walked straight in," he added. AFP reported that the man was not known to staff at the nursery. "You don't expect such acts happening in a daycare center," Dendermonde deputy prosecutor Jan Kerkhofs told CNN. "It is not like a prison so there are no bars on the doors or security systems."